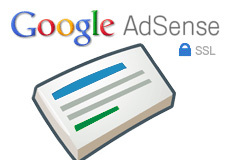 Google announced that HTTPS sites, SSL secured can now have Google AdSense ads on them without an issue. For this to work, you simply need to go into your AdSense console, click on your existing ad units and get the revised code. The revised or new code will work on both HTTPS and HTTP web sites without an issue. HTTPS-enabled sites require that all content on the page, including the ads, be SSL-compliant. As a result, our systems will remove all non-SSL compliant ads from competing in the auction on these pages. This means that if you convert your HTTP site to HTTPS, ads on your HTTPS pages might earn less than those on your HTTP pages. The big question publishers are asking.... What took so long Google?